White stripes, each about a meter wide, painted the land for as far as the eye could see. I was visiting the dry areas of the autonomous Ningxia region in northwest China with colleagues from the Chinese Academy of Agricultural Sciences and the nonprofit Centre for Agriculture and Biosciences International. Those strips of plastic sheeting, I was told, allow farmers to grow cash crops and grains despite the desert-like conditions. The sheets, usually composed of polyethylene, help conserve water, suppress weeds, and boost soil temperatures, effectively increasing crop yields by 20 to 60 percent. The use of plastic “mulch” to grow crops, known as the White Revolution, began in China in the late 1970s, and now covers 20 million hectares of the country’s agricultural land, an area equivalent to half the size of California. Other countries in the Middle East, Europe, and North America also use plastic mulch. Used sheets are expensive to collect and discard or recycle, leading some farmers to leave them on the field or illegally dump or burn them; often the sheets are not fully removed, as the thin plastic readily tears into small fragments that remain on the farmland, forming what is known in China as “white pollution.” As new plastic mulch is applied year after year, soils can become enriched with plastic residues, which change the physical and chemical properties of the habitat that so many plants, animals, and microorganisms call home. 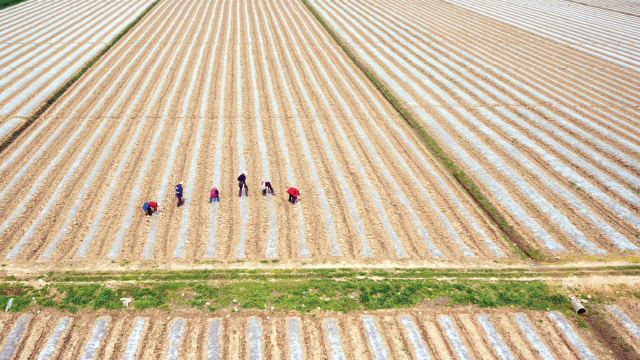 The use of plastic “mulch” to grow crops, known as the White Revolution, began in China in the late 1970s, and now covers 20 million hectares of the country’s agricultural land. The effects of plastic pollution in terrestrial environments remain largely unknown. To date, the majority of research has focused on aquatic systems, as 10 million to 20 million tons of plastic litter find their way to the oceans each year. Starting in the early 1960s, researchers began documenting dead seabirds with stomachs full of plastic. Then, in 1997, racing boat captain and oceanographer Charles Moore captured the public’s attention with his accounts of floating plastic debris in an area now known as the Great Pacific Garbage Patch, ranging from the West Coast of North America to Japan. In addition to large plastic trash, Moore described tiny colorful fragments, what are today known as microplastics, suggesting that a subtler pollutant was accumulating in the environment. In addition to resulting from the physical fragmentation of larger plastic products, microplastics—loosely defined as particles in the size range of 100 nanometers to 5 millimeters—are introduced into the environment as a result of their use in a wide range of applications, from personal-care products to industrial abrasives employed in paint removal or cleaning. Nanoplastic particles of less than 100 nanometers have also found a wide range of applications in adhesives, paints, electronics, and more. Marine organisms across all trophic levels have turned up with microplastics in their guts, and evidence is emerging from experimental studies that the plastic particles and the cocktail of chemicals they carry can wreak havoc on physiology, reproduction, development, and behavior in a range of species. Estimates of nano- and microplastic loading in terrestrial environments remain sparse, in part hindered by the heterogeneous nature of soil. But substantial levels of plastic pollution can be expected. Farmlands may be at particularly high risk. 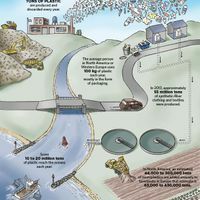 Even in areas that don’t employ plastic mulching, farmers may apply microplastics-ridden sewage sludge as fertilizer, and treated wastewater is an important source of water for irrigating farmland. 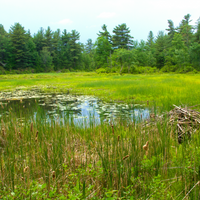 Last year, estimates by a group of Scandinavian and Czech researchers suggested that we could be inadvertently adding some 44,000 to 300,000 metric tons of microplastics annually to farmlands in North America, and another 63,000 to 430,000 tons in Europe. The quantities from each region alone, the researchers said, would exceed the estimated 93,000 to 236,000 tons of microplastics in the surface water of all Earth’s oceans.1 And new studies of terrestrial environments are showing that, like marine animals, soil organisms ingest these microplastics. While humanity moves slowly on addressing the plastics conundrum, small aquatic organisms are already making themselves at home on microplastic debris. In 2014, Julia Reisser of the University of Western Australia and her colleagues found that a diversity of algae, marine worms, barnacles, insect eggs, and microbes inhabit microplastics floating in the oceans surrounding Australia.2 Animals higher up in the food web that eat these organisms ingest the plastics along with the prey, setting the potential for harm to reverberate through the ecosystem. The growing levels of microplastics in the environment—both aquatic and terrestrial—should thus be cause for concern. 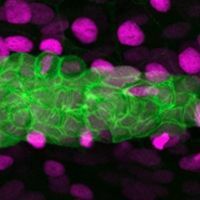 As plastic particles get smaller, a wider range of organisms is at risk of uptake or ingestion, and at the nanoscale, the particles can enter cells and move beyond the gastrointestinal system. Scientists’ understanding of the scale of the problem, in terms of both how much plastic pollution exists in the environment and the nature of the consequences for organisms and ecosystems, remains woefully inadequate. PLASTIC POLLUTION: Both macroplastic items, such as bags, bottles, and other packaging, and products containing micro- and nanoplastic particles—from cosmetics to paints—contaminate the Earth’s ecosystems. See full infographic: WEB | PDF© Al Granberg. Source: Nature, 537:488, 2016; Science, 347:768-71, 2015When examining the effects of plastic on the environment, researchers must assess not just the plastic polymer itself, which is generally considered inert, but the various chemicals (called additives) mixed in during the manufacturing process. A cocktail of plasticizers, such as phthalates, as well as flame retardants, stabilizers, pigments, and antimicrobials can improve the product’s properties, such as transparency, flexibility, and durability. Plastics also act as magnets for hydrophobic, or water-repelling, organic and inorganic pollutants, courtesy of their chemical and physical properties. Persistent organic pollutants, such as dioxins, polychlorinated biphenyls (PCB), dichlorodiphenyltrichloroethane (DDT), and polycyclic aromatic hydrocarbons (PAH), have been detected hitchhiking on marine plastics. Researchers have begun to document the toll of plastic additives and organic pollutants carried by microplastics on aquatic animals. 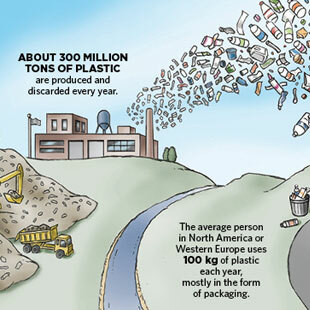 Once plastics have been consumed, some of the chemicals are released from the plastic and transferred to the animal. If the chemical is fat soluble, it may accumulate in an organism’s tissues. On land, the lifetime of plastics is estimated to be in the range of centuries. Because we currently have no way to get rid of them, microplastics will continue to persist and accumulate in soil and water. Huerta Lwanga and her colleagues have also shown that earthworms play a role in transporting microplastics from the surface of the soil deeper into the ground. 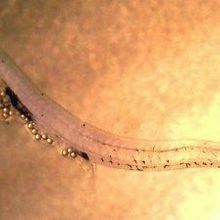 In experiments using thin boxes called formicaria that allow observation of the tunnels made by earthworms, the researchers found microplastics along the tunnels. A study published in March reported that springtails, a highly abundant group of microarthropods, can also transport microplastics in the soil.9 This movement of microplastics presumably makes the pollutants accessible to other soil organisms, though the possibility for bioaccumulation along the soil food web has yet to be determined. If plastics are making their way through terrestrial ecosystems, the risks to plants, which form the base of many terrestrial food webs, must be assessed. Microplastics are not expected to be a problem for plants, as their large molecular weight would prevent them from passing through plant cell walls. Nanoplastics, however, can and do get inside plant cells. A study using tobacco plant cells showed that nanopolystyrene beads of 20 to 40 nm were taken up, while beads of 100 nm were not.10 More research is needed to determine how plants are affected, however, and whether there are any knock-on effects in the ecosystem. Back in China, shipping containers full of plastic arrive at thousands of processing centers, ranging from small, family-run businesses to large operations. Almost half of recycled plastic waste in the U.S., Europe, and Australia is exported, and China is its biggest importer, using old plastic to make new products. 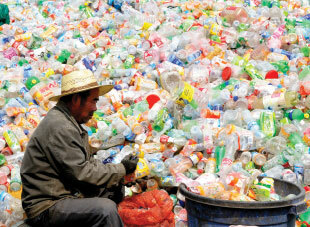 China is the largest producer of plastic products. In the award-winning documentary Plastic China, released in January of this year, director Wang Jiuliang captured images portraying the human and environmental costs of the plastic recycling trade: children playing amidst hills of trash, standing under a shower of fluffy plastic fibers, and using discarded surgical gloves as balloons. While the questions of environmental impacts and human health risk remain open (see “The Human Consequence”), the world continues to rely heavily on plastics that pollute the environment. Some 8 percent of global oil production is used in plastic manufacturing, both as the raw material and for energy to power the process. In Australia alone, 1.4 megatons of plastics were used during the 2011 to 2012 financial year. That is equivalent to the mass of some 1 million SUVs consumed by a country with a population of fewer than 23 million people. PLASTICS OVERLOAD: The sheer quantity of plastics and the material’s durability poses enormous challenges to waste recycling.© iSTOCK.COM/YOUNG777Ironically, durability, the characteristic that has made plastic so useful to humans, is a double-edged sword. 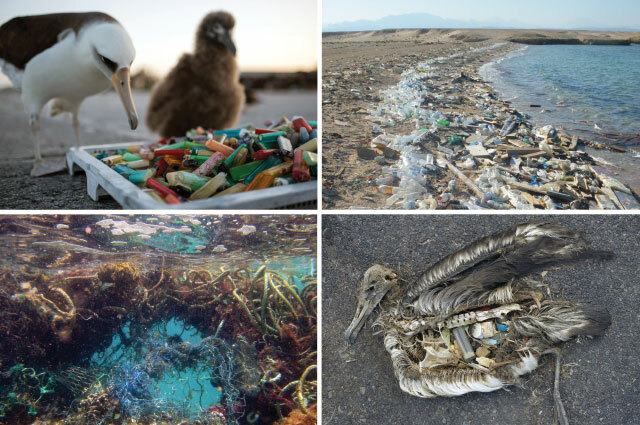 A stark reminder of how persistent plastics are and how far they can travel from their point of origin came in 2005, when an albatross was found with plastic debris in its guts from a World War II plane that had crashed in the sea some 9,000 kilometers away six decades earlier. On land, the lifetime of plastics is estimated to be in the range of centuries. Because we currently have no way to get rid of them, microplastics will continue to persist and accumulate in soil and water. So, what is the best thing to do based on current knowledge? We know that microplastics do not degrade easily in the environment. We know that nanoplastics can enter cells. We have observed that nano- and microplastics are ingested or taken up in a range of marine and terrestrial organisms and that some pollutants carried by microplastics are transferred from food to these consumers, with adverse effects. With such high stakes, we must engage in existing solutions rather than wait for definitive answers. As stated in the 1998 Wingspread Statement on the precautionary principle, “When the health of humans and the environment is at stake, it may not be necessary to wait for scientific certainty to take protective action.” Our priority should be to eliminate the unnecessary use of plastics, to improve and insist on biodegradable alternatives, and, above all, to fully understand what it means to live in a plasticized world. Ee Ling Ng is a research fellow at the University of Melbourne and manager for the Australia-China Joint Research Centre: Healthy Soils for Sustainable Food Production and Environmental Quality. PLASTICS’ EFFECTS: Research into the consequences of plastic pollution for organisms living in contaminated environments remains sparse. The most extensive work done so far has focused on plastic additives, such as bisphenol A, polybrominated diphenyl ethers, and phthalates. Laboratory experiments using rodent models have demonstrated that these compounds can disrupt the endocrine system, cause birth defects, reduce sperm production, trigger insulin resistance, and impair learning and memory. As plastic pollution invades Earth’s numerous ecosystems, it should come as no surprise that small particles and plastic additives have found their way into the human food supply. To date, no guidelines or regulations exist to limit the level of microplastics found in food products. And whether consuming these plastics will have effects on human health remains to be seen. Documenting such effects will require tracing each step along the pathways of exposure; food consumption is only one of those steps. It will also require research to reveal in greater detail how plastics, plastic additives, and other chemicals hitchhiking onto plastic during its residence in the environment act inside the body. We do know that plastic additives such as phthalates are already widespread in human populations, based on monitoring in the U.S. and Europe. And human epidemiological studies have revealed links between plastic additives and metabolic, thyroid, reproductive, and respiratory problems.14 But the pathways of exposure to these plastic additives are numerous, and ingestion of microplastics, based on current knowledge, is not expected to be the major contributor of these plastic additives found in people. Indeed, in a report on nano- and microplastics in food released in May 2016, the European Food Safety Agency (EFSA) Panel on Contaminants in the Food Chain stated that, while there is insufficient data for a complete human risk assessment, current evidence indicates microplastics in food are unlikely to be harmful. L. Nizzetto et al., “Pollution: Do microplastics spill on to farm soils?” Nature, 537:488, 2016. J. Reisser et al., “Millimeter-sized marine plastics: A new pelagic habitat for microorganisms and invertebrates,” PLOS ONE, doi:10.1371/journal.pone.0100289, 2014. M.S. Savoca et al., “Marine plastic debris emits a keystone infochemical for olfactory foraging seabirds,” Science Advances, 2:e1600395, 2016. E.L. Teuten et al., “Transport and release of chemicals from plastics to the environment and to wildlife,” Philos Trans R Soc Lond B Biol Sci, 364:2027-45, 2009. C.E. Talsness et al., “Components of plastic: Experimental studies in animals and relevance for human health,” Philos Trans R Soc Lond B Biol Sci, 364:2079-96, 2009. J. Wang et al., “Effects of plastic film residues on occurrence of phthalates and microbial activity in soils,” Chemosphere, 151:171-77, 2016. E. Huerta Lwanga et al., “Microplastics in the terrestrial ecosystem: Implications for Lumbricus terrestris (Oligochaeta, Lumbricidae),” Environ Sci Technol, 50:2685-91, 2016. A. Rodriguez-Seijo et al., “Histopathological and molecular effects of microplastics in Eisenia andrei Bouché,” Environ Pollut, 220A:495-503, 2017. S. Maaß et al., “Transport of microplastics by two collembolan species,” Environ Pollut, 225:456-59, 2017. V. Bandmann et al., “Uptake of fluorescent nano beads into BY2-cells involves clathrin-dependent and clathrin-independent endocytosis”, FEBS Lett, 586:3626-32, 2012. L. Van Cauwenberghe, C.R. Janssen, “Microplastics in bivalves cultured for human consumption,” Environ Pollut, 193:65-70, 2014. J. Wang et al., “Occurrence and risk assessment of phthalate esters (PAEs) in vegetables and soils of suburban plastic film greenhouses,” Sci Total Environ, 523:129-37, 2015. D. Yang et al., “Microplastic pollution in table salts from China,” Environ Sci Technol, 49:13622-27, 2015. J.D. Meeker et al., “Phthalates and other additives in plastics: human exposure and associated health outcomes,” Philos Trans R Soc Lond B Biol Sci, doi:10.1098/rstb.2008.0268, 2009.